Funding Destined to Develop Versions on PlayStation 4 and Steam. Kickstarter campaign to fund the creation of the videogame Time Wanderer on PlayStation 4 and Steam starts today. Collection on Kickstarter will also be used to create an artbook and to publish the original soundtrack. Time Wanderer starts about 1,000 years into the future, in the year 3012. Earth has been invaded by a reptilian alien race known at the Ro’tuls and the human race has been enslaved. This is when the brilliant scientist, Dr. Fhaiz, clandestinely creates a time machine in his basement and in a desperate act, sends his only child, Corina, back into the past with one mission: warn humanity of the Ro’tul invasion and prepare the world for the coming battle. But something goes terribly wrong and Corina gets lost in time, wandering through different time periods. Her new mission will be to survive while she searches for a way home to her own timeline and above all, avoid making permanent changes to the past to prevent causing a time paradox. Inspired by all time classics such as Chrono Trigger and ToZ: A Link to the Past, Time Wanderer is a breathtaking top-down 2D sci-fi action RPG with puzzles, combats, and lots of exploration. Take on the role of Corina and find the way back to your timeline as you visit different historical settings, such as Egypt, the Roman Empire and World War II. 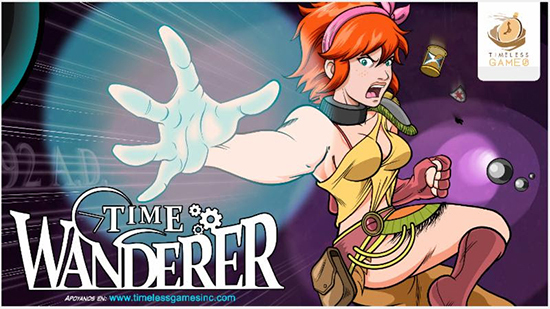 "Time Wanderer is the right title for gamers of all walks of life,", says Sergio Ordoño, CEO at Timeless Games Inc. “This Kickstarter campaign gives us the opportunity to launch a game that we put pounds and pounds of enthusiasm into to the gamers everywhere.”. The work on Time Wanderer started in June 2017 and since then we have created the art, we have developed the enemies’ AI, and we have constructed our own puzzle engine. We are currently preparing ourselves to produce the title, add more levels, and include unique game mechanics. Top-down 2D sci-fi action RPG with puzzles, combats, and lots of exploration. Find the way back to your timeline as you visit different historical settings. Inspired by all time classics such as Chrono Trigger and ToZ: A Link to the Past. Art, enemies’ AI, and our own puzzle engine are already built. Currently preparing ourselves to produce the title, add more levels, and include unique game mechanics. The game will be available for PlayStation 4 and Steam.